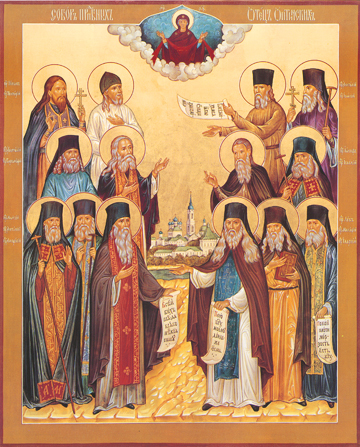 This icon depicts the 14 blessed elders who lived in Optina Monastery during the 19th century: Leo (Leonid), Makary, Ambrosy, Moses, Anthony, Hilarion, Isaac (the First), Anatoly (the Elder), Joseph, Barsanuphius, Anatoly (the Younger), Nektary, Isaac (the Second), and Nikon. These holy fathers, through the practice of deep obedience, eldership, and confession of thoughts, passed on the Living Tradition of God’s Grace from the spiritual revival of the disciples of St. Paisius Velichkovsky. Thousands flocked to these saints in their lifetime and after their deaths seeking spiritual direction and miraculous healings. They directed souls, taught the Jesus Prayer to many, and produced an outpouring of spiritual literature in the language of the people. Each had his own personality and his own approach, but they all had the same goal: the spiritual enlightenment and salvation of souls. Many directed other monasteries and convents. The Optina Startsy (Elders) served and directed both rich and poor, the famous and peasants, and were a mighty river of miraculous grace and love poured out in their life and still pouring out today.